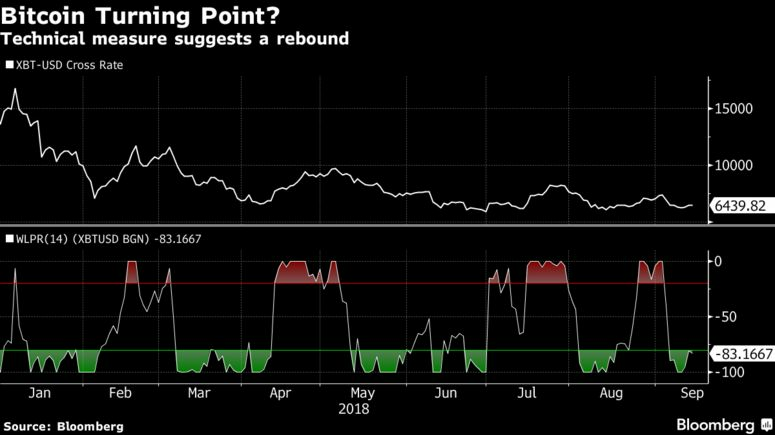 While the noted money manager attracted attention with his Twitter post on Thursday calling an end to this year’s collapse in the biggest cryptocurrency, a market reversal indicator that recognizes turning points says the selloff is overdone. The so-called Williams %R Indicator moves between 0 and -100 and measures overbought and oversold levels for traders searching for entry and exit points. A mark under -80 means oversold, which Bitcoin is currently showing. The last time Bitcoin hit this mark, it rallied 22 percent, to $7,361 from $6,017. It was trading at $6,502.73 as of 12:23 p.m. New York time Friday. Because the indicator can be prone to false signals, people typically use it along with other analysis to decide on market moves. If Bitcoin does not take out its previous high of $7,316, it will remain in its downward trend, technical analysis shows. Either way, Bitcoin bulls may be taking comfort in the optimistic views. The virtual currency is on pace to finish higher this week.